Want to win a brand new iPhone 6S? UPDATE: Our WINNER has been picked! Congrats! 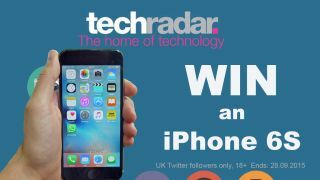 techradar has had a recent makeover, and to celebrate we're giving you the chance to win a brand new iPhone 6s. To enter, all you need to do is tweet us – or tag us in – a photo demonstrating why you think you need a brand new iPhone 6s. Perhaps you have a really old iPhone, smashed screen, bits falling off it. Send us your photo, follow the below criteria, and our judges will pick one lucky winner who they feel is in most desperate need of a new iPhone 6s. Because giving away a brand new iPhone 6S isn't enough, you can also download our completely free ebook that provides more info on the iPhone 6S and iOS 9 in one handy place.